It’s one of those things that has been an idea kicking around for a while now – what if we did a progressive art journal? What would it look like? How would it work? We could never quite find the answers to those questions, so it would get shelved and then brought up and shelved again. A few months back, we were chatting about it again, and in the midst of it all, in came an email from KikkiK K (of course), offering 70% off 2015 diaries. SEVEN. TEE. This brought cute little A6 diaries down to $7. And just like that, we were off and running. At $7 each, the question of “who keeps it when it’s done” answers itself – we all do. Car, Alley and I each have our own diary, and over the last little while have made a start on our pages. Yesterday, they all popped in the post and our own journals are off on an adventure. 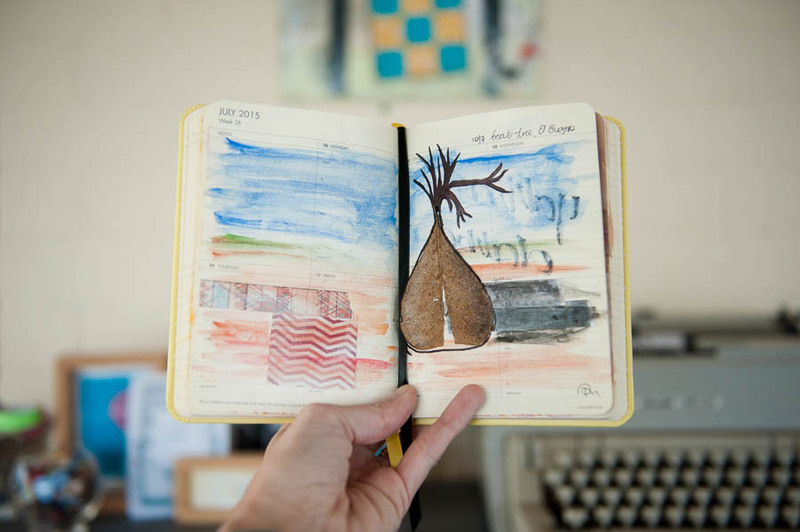 Each journal stays at each stop for a month, and they are posted onwards on the first of the months. During the month we have possession of someone else’s journal, we contribute a minimum of one page for the month, up to a maximum of one per week – ie, we are limited by the number of pages per month in the diary. That’s it, no other rules. We can add what we like, how we like, when we like. Above are two of my pages in my own diary. The top one is my absolute favourite – this was my first go at the typical mixed media whimsical face, and I am thrilled. She is completely freehand sketched and painted by yours truly. The second is a page I did while on our big trip, and while not totally loving the watercolours background, I still like that I was able to record that slice of life. To be honest, I’m still not entirely sure what I will be including in the journals entrusted to me. I have a few ideas in how I might create a monthly “template” for want of a better word, a guideline of the types of pages I want to include. I’m a lister, I work better if I have things written down where I can see them. I’m pretty sure a face or two will make an appearance. Some lettering. Beyond that, we will see where the muse takes me. I have a whole month to work it out. Have you ever attempted a progressive art journal? Any tips to help it run smoothly? This is fabulous! I can’t wait to see how all the journals evolve over time. Cannot wait to see them in person! got my thinking cap on and feeling a little more confident after some daily lettering / watercolour play. I love both your pages!